Treat yourself to pleasant rehydration after a day in the sun. It has a soothing and rehydrating effect on dry or stressed skin. Also suitable for sensitive skin. No need to rub in or wash off any products. You simply place the Powerlite MASQ+ over your face. Lean back and enjoy! 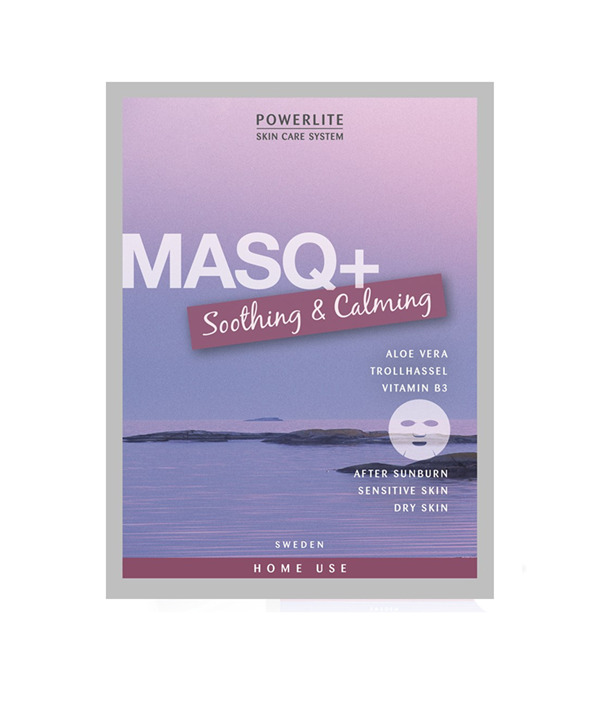 Powerlite MASQ+ Soothing & Calming is packed with active ingredients, including soothing aloe vera and witch hazel, which also has ant-inflammatory properties, and moisturising vitamin B3, which also reduces redness. Regular use of Powerlite MASQ+, two or three times a week, will keep your skin hydrated and give it at healthy glow. How to use: Wash your face and pat dry with a towel. Place the mask over your face. Leave for around 20-30 minutes, then remove the mask and massage in the remaining serum. Tip: Any leftover serum in the package can be applied to the neck and decolletage. Do not dispose of the mask immediately after use, but use the mask to apply the last remnants of serum to your arms and legs. This way you will be able to make use of every last precious drop of serum. Ingredients: aqua, glycerin, dipropylene glycol, butylene glycol, hamamelis virginiana (witch hazel), dimethyl sulfone, arginine, carbomer, peg-60 hydrogenated castor oil, betaine, niacinamide, sodium hyaluronate, aloe barbadensis juice, disodium EDTA, allantoin, hydrolyzed collagen, carrageenan, caprylhydroxamic acid, 1,2-hexanediol, caprylyl glycol, boswellia serrata, dipotassium glycyrrhizate, rosa centifolia, tocopheryl acetate, olea europaea, centella asiatica, camellia sinensis, diospyros kaki, aloe barbadensis extract, althaea rosea, eucalyptus oil.